Patrick Morrissy and Mary Phelan's son Laurence ('Lawrence' in some later documents') Morrissey married Johannah Meany around 1837. Laurence was born in 1818 and Johannah in 1820, both in Ireland. Just as Laurence's brother Patrick met and then married his wife Rose Farrell in the new world, probably Laurence met Johannah Meany soon after the Morrissy family arrived in New Brunswick. They were married at the Nelson Chapel near Beaubear's Island. From the time of his arrival in Montreal in the early 1840s to around 1875 Laurence worked as a shoemaker. From 1875 to the early 1880s he was a foreman and then a leather cutter until around 1900 when he may have retired or been unable to continue working. Laurence and Johannah's first son, Patrick, was born on 18 January 1838 in the Barnaby River area of New Brunswick and christened three weeks later on 8 February 1838. All of their other children were born in Montreal: my great grandfather Thomas was born in 1843; Michael, later in 1843; Mary in 1845; Patrick in 1847; and Margaret in 1849. They had six children that we know of. 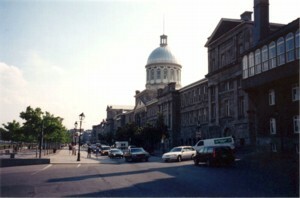 Laurence, Johannah, and their son Patrick arrived in Montreal some time between 1840 and 1843. The first record of their living in Montreal is the baptism of their second child, Thomas Morrissey. The baptismal record states that the child was born fifteen days before being baptized, he was the son of Laurence Morrissey, a cobbler, and Johannah Mainey (sic), domiciled in the parish. Laurence was absent at the baptism but the godmother stated that she knew the absent father. There are no Morrisseys listed in Lovell's City Directory for Montreal for 1842 to 1844, the first years that Lovell's was published, but in the 1844 edition there is a listing for "L. Morrisy", a shoemaker, who lived on Grey Nun, near Wellington Street. This is our first evidence of Laurence living in Montreal. There is also a first listing for "R. Morrisy", who lived at 11 George, near William Street. Both men arrived no later than 1843 in order to be included in the 1844-45 edition of Lovell's Directory. Laurence is the first Morrissey ever listed in Lovell's, and he and Richard are the only Morrisseys listed for the editions published from 1844 to 1848. It would be a mistake to think that Laurence and Richard were the first Morrisseys to live in Montreal. The earliest record is for the death of Marie Moricy on 25 June 1820, but there is also listed in the index of Catholic burials the following: John Morrissey on 29 October 1832; Mary Morrissey (also spelled phonetically 'Marissee') on 19 May 1832; Daniel Morisy on 4 July 1840, and Patrick Morissey (sic) on 18 August 1841. 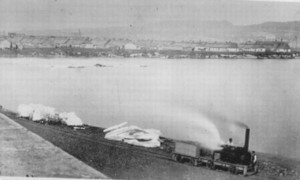 Irish immigrants, escaping the 1847 famine, succumbed to thyphoid fever and were quarantined in the "Fever sheds", seen in the background, in the present-day area adjacent to the Victoria Bridge; Mount Royal can be seen on the horizon. The 1861 census for Montreal, St. Laurence Ward, indicates that Laurence and Johannah were born in Ireland. When the census was taken, Laurence was 43 years old, and Johannah was 41 years old. If they arrived in Montreal in 1843, they were just 25 and 23 years old respectively. The family occupied a one story, wood frame house, and Laurence's occupation is listed as a shoemaker. The first initials of the children's names and some of their ages are difficult to read on the census. Two sons are on the census form. A twenty-one year old, born in New Brunswick, is listed as a shoemaker, this could be Patrick but his age should be around twenty-three. Another son who is seventeen years old and employed as a plumber would be my great grandfather, Thomas Morrissey. Two daughters are listed, ages twelve and sixteen. The sixteen year old would be Mary Morrissey, born in 1845, who was buried at Notre Dame des Neiges Cemetery in 1861. The other daughter, age twelve, would be Margaret Morrissey, born in 1849, who later married Patrick McCabe. Not recorded in the 1861 census are Patrick Morrissey, born in Montreal in 1847 and Michael Morrissey, also born in Montreal but in 1843 and who died in 1861 at age eighteen years. In 1849, Laurence and his family were living at 9 St. Charles Borromee Street (on today's Clark Street near the corner of St. Antoine Street); in 1853 they were at 51 St. Charles Borromee; then in 1855, 63 St. Charles Borromee; in 1859 at 81 St. Charles Borromee. By 1862 they had moved to 29 Vallee Street; 1863 at 31 Vallee; and in 1865 at 37 Vallee, the address to which William Morrissy wrote to Laurence in 1866. Vallee Street ceased to exist in the late 1960s when Complexe Desjardin was built. Vallee Street ran parallel to Ste. Catherine Street between Jeanne Mance and St. Urbain Street. 37 Vallee continued to be Laurence's residence until 1884 when he moved to 39 Vallee; in 1901 he moved to 34 Vallee and lived there until his death in 1904. Born in Carrick-on-Suir in 1820, Johannah Meany married Laurence Morrissey in Miramichi probably around March or April 1837. Johannah and Laurence's first child, Patrick Morrissy, was born in Miramichi nine months later, in January 1838. In the early 1840s they moved to Montreal. Johannah Meany's last name presented a problem for her in that it is pronounced differently than it is spelled. Even in the card catalogue from St. Patrick's Church records in Nelson, Miramichi, for the baptism of Johannah's first son Patrick Morrissy on 8 February 1838, Johannah's name is written "Johanna Miany" and below this someone has written "This name may be incorrect." The confusion with Johannah's last name lies in the fact that while it is spelled "Meany" it is pronounced "Main-y", as it still is in County Tipperary today. This is close to the original Irish "O'Maonaigh". When the name was Anglicized to Meany/Meaney the "ea" was heard and pronounced as "ay", as in "may". Similarly, "tea" was pronounced "tay", and "please" "plase", and so on. Even if still written "ea" it may be pronounced "ay" in Ireland. Because of the numerous and different misspellings of the name, I suspect she was illiterate. Johannah Meany died in her sixtieth year and was buried at Notre Dame des Neiges Cemetery on 29 April 1880. She left behind her husband Laurence, four of her six children who were still alive, eleven grandchildren, and relatives in Ireland with whom members of the family still corresponded. Laurence was eighty-five years old when he died and was buried beside Johannah at Notre Dame des Neiges Cemetery on 19 January 1904. On 29 April 1881, a year to the day after Johannah was buried, Laurence married Marie Emma Mercier at Notre Dame Church in Montreal. Marie Emma Mercier was the daughter of Edouard Mercier and Julie Gagnon. Laurence was living alone at 37 Vallee, where he had lived with Johannah, when the 1881 census was taken. Laurence and his new wife moved to 39 Vallee and lived there from 1883 to 1894. We have an insight into Laurence's personal life in the 1891 Census. He and Emma now have a nine year old son, named John Morrissey, born in late 1882. In this census, Laurence is listed as being 60 years old, in fact he was around seventy-three; Emma is listed as being forty years old. For whatever reason, sometime during 1894-1895 Laurence lived with his son Thomas Morrissey at 78 Plymouth Grove, but we don't know if Emma and their son were living there with him. If they were, it would have been a very crowded household as Thomas and Mary had nine children at home in 1891, and only one of these children could have been old enough to leave home by 1894. In 1895 Laurence was back at 39 Valee, then there are a few years when he is not listed in Lovell's, and finally in 1901 he is listed in Lovell's as residing at 34 Vallee until his death in January 1904. In 1904-1905 John L. Morrissey, a clerk at the C.P.R. telegrapher's office, and Laurence's widow Emma Morrissey, are listed as living at 34 Vallee. This continues until 1910 when we lose track of Emma Mercier Morrissey. There is a 'John Laurence' buried with Laurence and Johannah at Notre Dame des Neiges Cemetery. As 'Laurence' is not a surname that I recognize in our family, I believe this is a clerical error and that this is Laurence and Emma's son, John Laurence Morrissey, who was buried on 30 September 1915. Laurence's sister, Catherine Morrissey, was born in Ireland and came to New Brunswick with the family in 1837. According to a family tree given to me by Jane Morrissy Allan, Catherine lived in Montreal, but the date when she arrived here, or other details of her life, remains unknown. If she married is unknown and she is not listed in the 1881 Census, nor is she listed in Lovell's Directory. Of the five Catherine Morrisseys buried at Notre Dame des Neiges Cemetery, only two could have been our Catherine, one died in 1905 and the other in 1893. I have chosen the latter, who was buried on 15 April 1893, for only one reason and that is because of the three other people buried in the cemetery plot that Catherine purchased, one is named Laurence (surname is Gallagher; buried 15 September 1894). In addition to Catherine Morrissey and Laurence Gallagher, there is Agnes Gallagher, buried 3 November 1894 and Ondoyee Gallagher, buried 3 January 1896.
Who was Richard Morrissy? Was he Laurence's brother? Was he a cousin? There is anecdotal evidence connecting the two men'some family members who know of Laurence also refer to Richard Morrissy and his wife Catherine O'Brien as family members. Richard Morrissy, according to an official list of Catholics who died in Montreal, was born in 1821. His presence in Montreal is first recorded in Lovell's Montreal City Directory in the 1845-46 edition, when he was residing at "11 George, near William", employed like Laurence as a shoemaker. In 1856 he is listed as a labourer, living on McCord; in 1858 he resides "opposite 67 McCord"; in 1860, 66 McCord; 1863, "rear of 66 McCord nr William Street, Griffintown"; 1865, 156 McCord; in 1872 he was working as a gardener and resided at 83 Versailles; and from 1875 to his death in October 1888, he lived at 85 Versailles. Four tenuous facts connect Richard to Laurence Morrissey. The first is the comment by a family member that Richard Morrissy is somehow related to Laurence; second, that he spells his last name, Morrissy, with no "e", as Laurence did originally; third, like Laurence, Richard worked as a shoemaker; and, finally, he is only slightly younger than Laurence. Unfortunately, Richard is not mentioned in William Morrissy's letter to Laurence, but neither is Laurence's sister, Catherine Morrissey. 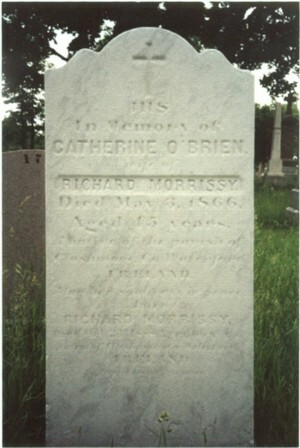 Richard Morrissy was married two times, the first marriage to Catherine O'Brien who was buried at Notre Dame des Neiges Cemetery on 3 May 1866, she was only forty-five years old at the time of her death. A second marriage, to Mary Murphy, took place at La Cathedrale in Montreal on 2 November 1870 and lasted eighteen years. According to the 1881 census for Montreal, 'Richard Morrissay' was born in 1826 and Mary Murphy was ten years his senior, born in 1816, both in Ireland. The misspelling of his surname suggests that it was transcribed phonetically, and that whoever spoke with the census takers had an Irish accent. There were no other residents in the household in 1881. Richard and Mary died within a week of each other, in October 1888. Mary was buried on 17 October 1888 and Richard on 25 October 1888. 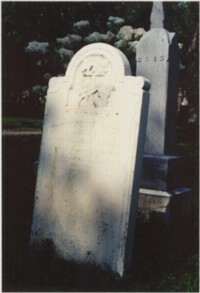 Richard is buried with his second wife Mary Murphy, directly next to them is the grave of Catherine O'Brien. We know that Laurence didn't lose contact with his Morrissey relatives in New Brunswick. Laurence's nephew Frank Morrissy married Josephine Holt at St. Patrick's Church in Montreal in 1899 and the two branches of the family sometimes corresponded by mail. Other Morrisseys listed in Lovell's City Directory may be some of Laurence's children. We know that Patrick and Johannah's youngest daughter, Margaret, married Patrick McCabe on 22 June 1870 at St. Patrick's; she died on 14 April 1931. Tally Morrissy, a granddaughter of John V. Morrissey, visited with Margaret in Montreal and I have already quoted from Margaret's daughter Lily McCabe's letter to Tally written in 1956. The "Molly" that Lily McCabe mentions in her letter is Mary Rose Morrissy (born Newcastle, 1885; died Newcastle, 1955), a daughter of John V. Morrissy. 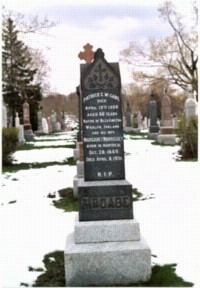 Lillian McCabe died in Montreal in 1962 and is buried at Notre Dame des Neiges Cemetery in the McCabe family plot. William Morrissy's letter to Laurence, of 5 May 1866, is intelligent and well written. Laurence obviously enjoyed William's letter, he kept the letter until he gave it to Mona McWilliam of Miramichi. William (who was around twenty years of age when he wrote the letter) mentions that his sister Mary had become a schoolteacher, and had not entered a convent as Laurence seems to have thought. William suggests that Mary might like to correspond with her cousin Margaret in Montreal. Margaret was seventeen years old at that time; William's sister Mary would have been four years her senior. William then goes on to discuss what has been happening with his other siblings. There is a feeling of concern for Laurence, of having lost touch with him. There is also something that is not mentioned directly, of what happened to Laurence and Johannah's two children Michael and Mary who were both buried on 11 July 1861 in Notre Dame des Neiges Cemetery. William's letter refers obliquely to Mary, but we do not know the circumstances of the deaths of either child. Children: Mary Ann, Michael, Margaret, John, Johannah, Ellen, Thomas, James Joseph, James Leo, Luke, Patrick (see next chapter for detailed discussion). Note: This is possibly William 'Patrick' Morrissey, who was buried with Laurence and Johannah on 10 July 1883 at Notre Dame des Neiges Cemetery.